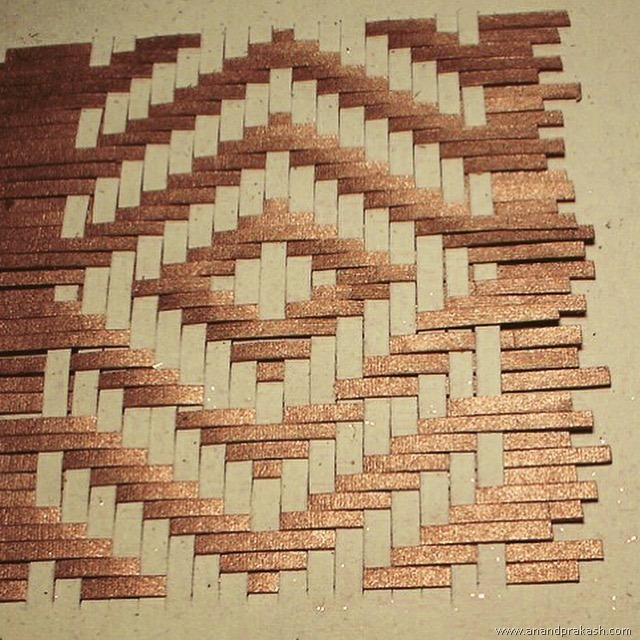 This is vintage Anand Prakash , Strips of paper woven on a handmade paper card. This looks easy but it isn’t because the paper is very delicate as compared to cane and it becomes difficult to push the strips in. The pattern requires some calculation as one has to know when to go over or below. The story of this pattern is interesting, Santosh was the craftsman who came up with this idea as he came from a family of chair-weavers and it came naturally to him. Since inception, I have learnt a lot from a wide variety of people which includes children. The best ideas have come from the most unexpected of sources. This entry was posted in Whats New and tagged anandprakash, Handmadepaper, Paperweaving, Recycledpaper. Bookmark the permalink.